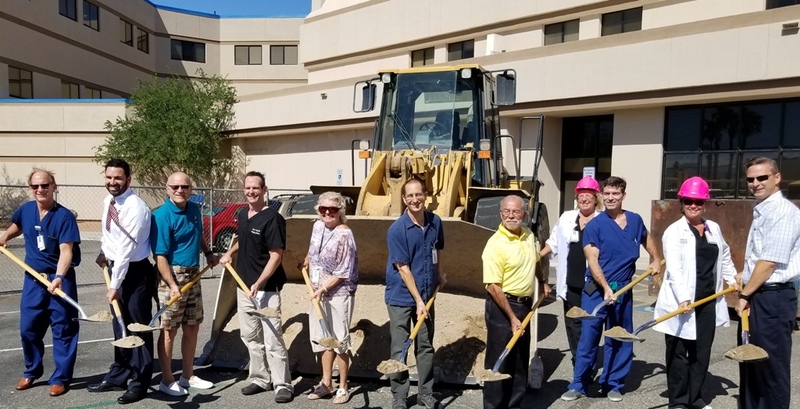 The Lake Havasu Area Chamber provided a ground breaking ceremony for the renovation and expansion of the Havasu Regional Medical Center Emergency Department (ED). $12 Million plus LifePoint investment for a growing community demand, 2 plus year construction project for renovation and expansion. There will be six phases to continue patient care, completion targeted at the end of 2019. The project will improve physical space, productivity and flow, expand treatment space for the growing community, purchase of updated equipment, update the environment of care, and enhance “Main Entrance” of the ED which will be relocated to the front of the hospital. Attending the ceremony from left to right were Dr. Michael Rosen CMO, Wes Taylor COO, John Nygren HCHF, Dr. Brian Scott, Linda Riesdorph – Board Member, Dr. Michael Sheehy, Mayor Mark Nexsen, Andrea Pilkington – ED Director, Dr. Devin Cunning – Chief of Staff, Tonia McCarthy – ED Clinical Manager and Michael Patterson CEO.